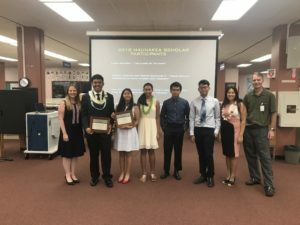 April 17, 2018: The final Maunakea Scholars awards ceremony of the year was held at Honokaa High School. After months of traveling around the state awarding telescope time, it was satisfying to wrap up the year on the Big Island. The 2017-2018 school year was a busy and exciting time, with a record number of schools and students participating. Twenty-six projects and thirty-six students received time on the Maunakea Observatories, Las Cumbres Observatory and Robo-AO. The Honokaa students wasted no time in collecting their data. Shania and Kira observed Malin 1 at the Subaru Observatory on April 22nd, less than a week after receiving their telescope time. Congratulations to all the students that received telescope time this year. We are excited to see what your future holds and where your research takes you. The Molokai HS Maunakea Scholars Cohort. Exceptional Molokai Students Received Telescope Time In the Inaugural Year. March 16, 2017: For the first time ever, the Maunakea Observatories reached the students of Molokai in the biggest way possible, telescope time on the Maunakea Observatories. 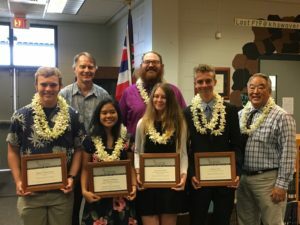 Executive director of the Canada-France-Hawaii Telescope (CFHT), Doug Simons, Mary Beth Laychak, CFHT outreach manager, and UH Institute for Astronomy Maui astronomer JD Armstrong visited Molokai High School to award telescope time to three students. Mentored by JD Armstrong, the students spent months exploring cutting edge topics in astronomy before writing their proposals. Under his mentorship, they selected topics from black holes to cratering on the moon and the universe between. Three students were selected to receive observing time. These three students will work alongside Dr. Armstrong and the Maunakea Scholars team to conduct their research. We hope to see these students use their data to push the boundaries of what they think is possible. March 2, 2018: A couple of weeks after our announcement of Kapolei High School Maunakea Scholars winners, Maunakea Observatories and DOE leadership visited upon Kalani High School, where teachers, students and families gathered in great anticipation of this season’s award recipients. The 2017-2018 school year has, thus far, been an incredibly busy and exciting season, with a record number of schools and telescope partners joining the Maunakea Scholars program. 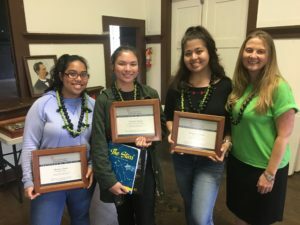 Kalani High School is a returning participant to the program, with three students awarded time using two Maunakea observatories last year. 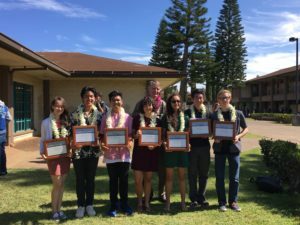 This year, Maunakea Scholars is recognizing six Kalani students whose inspired research and proposals, developed with guidance by mentors from the University of Hawai‘i Institute for Astronomy, has earned them research time with the NASA Infrared Telescope Facility and Gemini Observatory atop Maunakea, and the Las Cumbres Observatory on Maui. The King Kekaulike students awarded telescope time outside the school library. 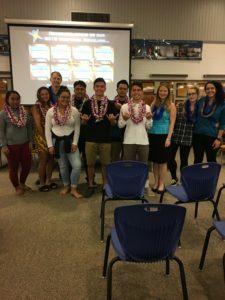 February 14, 2018: Awards season continues as Maunakea Observatories staff convene educators, community leaders, students and families at King Kekaulike High School in Maui to announce the newest winners of the Maunakea Scholars program. The student recipients are the first to come from Maui as the 2017-2018 program represents the inaugural participation of a school from the Valley Isle. 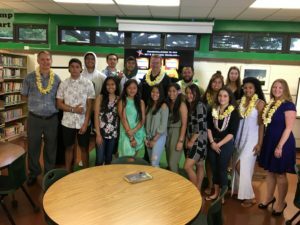 King Kekaulike students spent months analyzing data and preparing professional-style research proposals under the guidance of University of Hawai‘i’s Institute for Astronomy mentor, Dr. JD Armstrong. Greatly admired as both a scientist and educator in the Maui community with an amazing body of research and a summer science program that produces award-winning young astronomers, Dr. Armstrong helped King Kekaulike students transform their personal curiosities and interests into innovative and promising projects, with seven individuals earning invaluable observatory time. These students, along with each and every Maunakea Scholars winner, will receive coveted telescope time atop Maunakea. Every student will be paired with a mentor and telescope staff who will navigate them through their research. We have seen past students use their telescope time to explore black holes, exoplanets, comets, search for signs of life and much more, and we foresee our 2017-2018 Maunakea Scholars winners testing the boundaries of science as they delve into the big and magical world of astronomy. 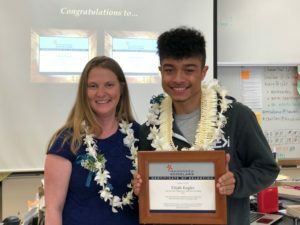 Today we kicked off the Maunakea Scholars awards season by announcing our first round of winners from Kealakehe High School in Kailua Kona, Hawai‘i. Executive Director of the Canada-France-Hawai‘i Telescope (CFHT), Doug Simons, joined excited students, teachers and families to award four exceptional student observers observing time for their scientific research at one of the world’s most powerful telescopes. Simons shared his personal story of how STEM education opened incredible doors for him, leading to his present position with Canada-France-Hawai‘i Telescope. Hawai‘i Department of Education leadership congratulated the students on their work and remarkable achievements. Leadership from the observatories selection committee spoke with individual project teams about the merits of their proposal, each of which was creative, sophisticated and ambitious. 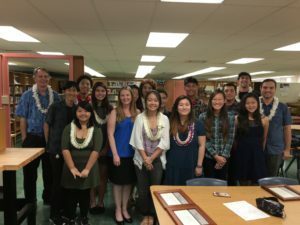 Students worked for months alongside mentors from the University of Hawai‘i Institute for Astronomy, and while every student compiled fantastic proposals, the projects of these four stood out as the most creative, scientifically promising and technically viable. Our winners received certificates noting their achievement, and will soon embark on a visit to Maunakea, where they will have the amazing opportunity to collect data for their projects using a world-class telescope under the guidance of highly skilled and experienced mentors.